“The reality is that writing is a lonely, private and poor-paying affair. For every writer kissed by fortune there are thousands more whose longing is never requited. Even those who succeed often know long periods of neglect and poverty. I did. “When I left a 20-year career in the Coast Guard to become a freelance writer, I had no prospects at all. What I did have was a friend in New York City, George Sims, with whom I’d grown up in Henning, Tennessee. George found me my home, a cleaned-out storage room in the Greenwich Village apartment building where he worked as superintendent. It didn’t even matter that it was cold and had no bathroom. I immediately bought a used manual typewriter and felt like a genuine writer. You want to be a writer? 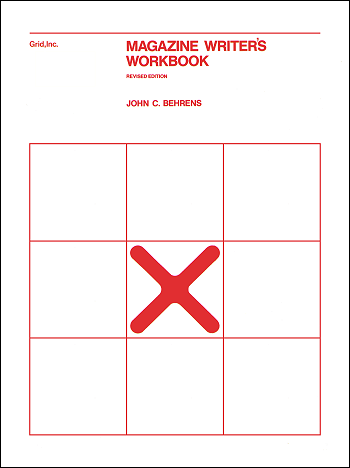 I am one—yes, which is why Prof. John Behrens asked me to write an introductory note for this workbook. “Kind of a memorandum for beginners,” he said. It flashed my mind back to that time for myself. It was about fifteen years ago. I would have qualified, I think, as the most “beginning” writer there ever was. There’s just nobody reading this who could have known less about the craft. Indeed, if you’re reading this the odds are that as of now you know more than I did, because my beginning actually was without any idea then of ever trying to be a writer. I was just writing letters, long ones. I was a sailor, in the U.S. Coast Guard, on a ship in the South Pacific. I was a cook on a ship that spent plenty of time at sea. There was nowhere I could go, nothing particularly to do on evenings when the day’s final pots and pans had been washed; and so, for lack of anything more interesting to do, I would write these long, long letters, to friends about whatever came to mind. Sometimes, I have reflected that really the fundamental reason I am a writer today is because then I happened to have a portable typewriter on the ship with me. I really couldn’t begin to tell you … I haven’t really the adequate words to truly express to you, what all has occurred in those fifteen years since. The “paying of the dues,” as jazzmen express the trials and tribulations, would fill the whole book to which this Foreword is attached. But there is so much more involved than simply being rejected, so much more you have to go through, to become a “successful” writer. Indeed by now, I have developed a theory that actual writing is about one-fourth of achieving “success.” You’ve got to learn, the hard way, strict self-discipline—which is the hardest form of it. You’ve got to develop, and project, that certain eye and ear for subject matter; that certain feel in its development. You’ve got to acquire, painfully bit-by-bit, a cumulative knowledge, a sense, a veritable gamut of those editors sitting behind those desks. This is the kind of thing you want to do? I will try to tell you how to do it, the best I can. About the first thing I’d say is you’re doing one of the best things just being in John Behrens’ class. It isn’t to puff his head that I say it’s one of the very best, one of the most effective writing classes I have ever seen anywhere (including the highly-touted classes at a couple of universities you probably have heard of). The reason is that John is not stressing the theories of writing. Editors don’t buy theories. What’s being stressed in this class is working at writing, and selling that work. There’s no better way. That’s the acid test. The reason I don’t say more is because there is so much that nobody can teach you, or guide you in, that you just have to sweat out. By and large, I think that the most advantageous market for the beginner to whack at are the magazines—of which there are over 4000 in America today, all of them looking for that fresh, new writer. Please believe that: they truly are. Don’t lure yourself into that old cliche, which really is nothing but a crutch. “You have to know somebody” or “They won’t read your manuscript unless they know you.” The hard truth is that a sharp editor can generally glance over the first two pages and determine right there if you have sent him something worth more of his reading time. Another reason magazines are ideal as a starting place—I say this as opposed to books—is because they require tighter, more disciplined writing than books do. And if you learn the magazine crafting in that shorter space, it will help you if and when you do decide to try books, or plays, or movie scenarios, or whatever else, for that matter. Ability to write succinctly is always to your decided advantage. So let’s assume now you’ve agreed, “Yes, I want to learn to sell to magazines.” With that, now we will back up a bit, to the most important thing you must do. You say, even to yourself, you want to be a writer. But, the point is, the thing you really have got to establish, like a bonded pact with yourself, is are you truly sincere? Have you got the patience, the guts, the stability and the durability and I don’t know what other corollary requisites that you are willing to go through whatever may be the obstacles that you are going to meet—not for weeks, not for months, but for years? Because if you ain’t baby; if you think that for any reason you can’t baby, then you ain’t going to succeed as a writer. So, unless you just want to fiddle with it for kicks, and understand that’s exactly what you’re doing, then there is no reason for you to start. Do something else. Get a salaried job. Assuming you do feel you have these above requisites, then you must approach the physical factor of how much you are going to devote to this process of becoming a writer. It needs to be projected, planned logistically, ideally. You have absolutely got to be able, somehow, to put in that time at a typewriter. Years of time. People talk about you’ve got to write that million words; well, I guess so, maybe more than that, but less important than so many words is how much time. Because that’s how you gradually, cumulatively acquire that utterly vital subjective affinity for this business. That typewriter has got to become like a wife (although it does have some limitations there); or a husband, if you’re a girl. And if you do not give it constant, focused attention, the marriage is not going to produce. So plan how and when, are you going to be able to work—alone, away in solace (and often suffering) from everybody. Again, I don’t care if its mother, daddy, wife, baby, or what—I am just telling you the way it is; this time I am talking about what has got to be: Just you and that typewriter—becoming as one. Because, you know, the only way you’re going to make it is with that typewriter’s total rapport. Now, what to do? Your mind’s made up. You’ve fixed it so that you are going to put in time. You are going to aim for magazines. I would get about six issues of the magazines I felt that I first should want to try and sell to. I would read them, dissecting what I read, until I felt I knew that magazine better than its editors. And the subjects that it liked to use. And then I would figure out such a comparable subject, and I would let fly with work. And when it was done, to the very best I could do—never before around five or six rewrites, trying each time to compress it more, then I would send it out. I would just pick a name off the masthead, usually the second or third listed editor, and address my effort to him, and go drop it in a mailbox, and try to forget it, and work on something else entirely. Never, never, never put all your hopes on one thing. Have a number of subjects going. Never, never, never (which I used to do) quit writing while you wait to hear from something you have mailed. When it comes back, rejected, as the odds are very great that it will, you are cast down in the dumps, depressed, depressed, depressed. Which is not the flavor of mind for anybody’s best work. You need to be buoyant. You have got to believe in yourself, that you know you are working just as hard, and as ably as you can, and that if it takes you years (as probably it certainly is going to do) one day you are going to sell. My very first sale was something I had mailed to a magazine, intending it as an outline. I didn’t have sense enough to know that you didn’t mail to anybody eight-page outlines, at least for magazine articles. This first sale for me came, mind you, after I had written every single day for eight years. And what the editor then bought that outline for—he paid $100—was not for my writing, but for the material I had in it. Now, this year, I project I will earn from various writing substantially more than $100,000 (before taxes, let me hastily add). And if you want to hear the truth, nothing I will sell will give me anywhere the joy of the first check. And if you want to hear another truth, I sincerely believe that you, assuming that you are equipped with average intelligence, can, ultimately reap as much or more from writing—if you are really willing, as I keep returning to, to intensively, indefatigably, for however long it takes, to work. Show me 100 serious-aspirant writers who never “succeeded,” in financial terms anyway; I will show you at least 95 of them whose Achilles Heel was that they really fell short in the area of investing the unflagging, unceasing, determined work. Nothing about this trade is easy, friend. When and if you get to the point that wherever you show your face in editorial circles, you are getting wooed, and wined and dined, their object in so doing is then, again primarily to lure you into more work. Into sitting up with your typewriter far into the wee hours, as I have been doing tonight. You get boxed-in, you get hooked, you know? There seems always to be just that next job, or that next couple, then, after that (in your projection), by gosh, I’m going to take it easy. Huh-ho! It very likely ain’t never going to happen. Maugham is a very good example. I think he lost count of how many times, rich as Croesus from writing, he “retired”—until, finally, he passed away. I find that I keep drifting up to what it’s like at this point, where I am sitting now; and I keep reminding myself that what I am supposed to be writing is what it is like at that point, that beginning, where ostensibly, you who are reading this now are. I know I really haven’t told you so much. Mostly, just my instincts. I have been trying to convey to you some feeling of what it is like, this writing for a living. The fact is, I don’t know, really, if there is so much, of specifically instructive nature, that I, or anyone, can tell you, and say, in effect, “Now, that’s it. That’s what you must do, to succeed.” About the only really absolute thing you can be told, to help you, to guide you, is the word I have kept hammering at throughout this rambling discourse. And that is—it’s you who want to write. It’s you who want to be a “success.” So, it’s squarely up to you. I can tell you absolutely that I know personally there isn’t an editor, a publisher, anybody who buys writing, in the business, who isn’t searching, hoping, even praying, that he, or she will be the lucky one to “discover” that obviously truly able newcomer professional writer. That’s what you want to become. I can tell you, again, in one word, how to become one among that couple of dozen or so who emerge into this new status each year. As hard as you can, as faithfully as you can; and with every good-luck which I can convey, sincerely to you; you work. ~ Alex Haley.